In space, lightness and darkness, speed and time are all at extremes. As an astronaut, your very life relies on the many intricate and complex systems created to sustain you in an extreme environment. One of those systems is the astronaut suit. Dave Wolf knows better than anyone how critical each and every component of the astronaut suit is. As a NASA astronaut who has worked on space stations hundreds of miles above the earth, he has had some pretty incredible experiences. One of those experiences was a near-death incident in which his life-sustaining suit was compromised. He and a fellow astronaut working on a space station suddenly realized they were trapped out in space, unable to get back into their craft. The door wouldn’t open. After several hours of work on the door, racing against the clock before a critical component of their suit shut down – the one that cleared CO2 from the inside –they had a decision to make. They could try to enter another portal on the craft, but they would have to untether their suits. That would leave them with about eight minutes before the suit no longer functioned as it should and something very bad happened. Luckily, they made it back into the craft and lived to tell the story. As I was listening to this story unfold on WNYC Studio’s Radiolab podcast – listen to the astronaut’s story here, it is great – what struck me was the similarities of the complex systems that sustain astronauts out in space to the complex systems in our operating rooms that sustain patients here on earth. Before, during, and after a surgical case, every person involved, every piece of equipment, every decision – all must be in concert and on time to ensure success, improving clinician morale and the bottom line. But, as you have likely experienced, this is not always the case. There is a way to help ensure things go smoothly – by analyzing the workflow of all the teams involved in a surgical case, and then, refining systems to align those teams. Structure OR operations into a framework. Organize key opportunities for improvement. Prioritize issues that will give impactful results. I first learned about the Perioperative Efficiency Model from the Association of periOperative Registered Nurses (AORN). 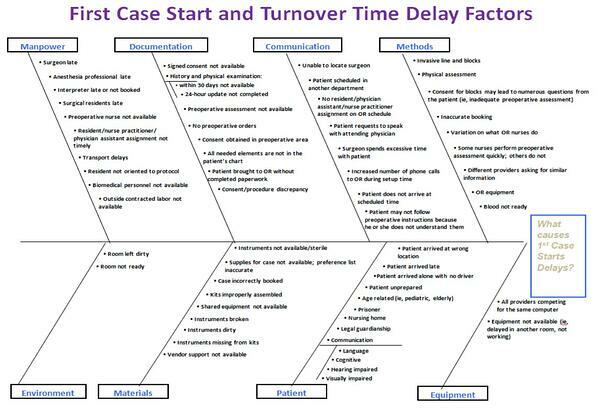 It is a model documented by Beth Israel Deaconess Medical Center that explains the complex systems within a perioperative services department that come together, before, during, and after a surgical case. The model successfully illustrates how separate systems in the operating room can integrate into an efficient workflow where sequence, timing, and dependencies line up. In the illustration above, the patient cycle begins in the bottom left, not in the operating room, but with the clerical tasks that come with checking a patient in. 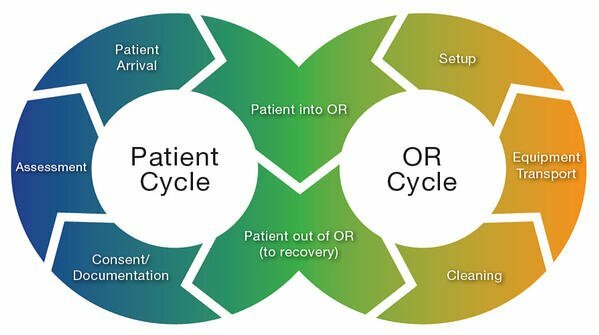 As the cycle moves forward, the patient is transferred between teams, goes through surgery, and is transferred to recovery. Meanwhile, and represented in the cycle on the right, teams are cleaning, then preparing the OR with the appropriate equipment and supplies for the surgical case. "The goal of this learning activity is to educate perioperative RNs about effective patient- and team-focused strategies to improve operational efficiency in the perioperative setting, with an emphasis on safely preparing patients for surgery; patient, family, and perioperative team member satisfaction; instrument processing and preparation; and, starting surgical procedures on time." Of course, issues will arise, and AORN has done a nice job of identifying the common issues encountered. Manpower: Team members being late, transportation delays, and so on. Documentation: Paperwork not being completed. Communication: Communication between team members (or lack thereof) and time spent communicating with patients. Methods: Different methods team members use to prepare for the procedure. Environment: The cleanliness and readiness of the operating room. Materials: OR instruments and supplies being incorrect, broken, dirty, and so on. Patient: Delays caused by the patient. Equipment: Equipment not being available. The OR cycle: Environment, materials, and equipment. After identifying the major issues hindering your perioperative workflow, you will need to prioritize which you are going to work on first. It is not advisable to work on all eight of the categories – that would be nearly impossible to tackle in a reasonable amount of time. What you are looking for are the fixes that will make the biggest impact. Dive into more research from organizations and academics that have information on how to approach fixing the common problems in the perioperative workflow. AORN and OR Manager are good places to start. Listen to common complaints among staff to identify recurring themes around inefficiencies or those that may have the most detrimental impact to workflow. 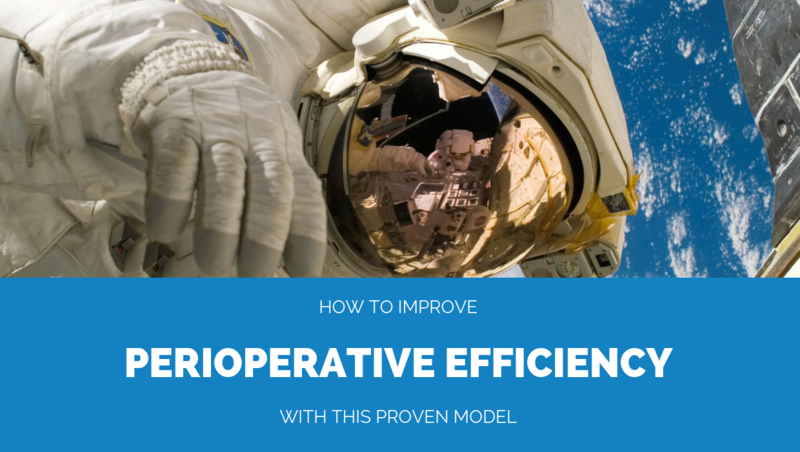 Observe your workflow with the Perioperative Efficiency Model in mind – this could be done with an informal approach or a more structured initiative using lean healthcare. At the end of this process, you will be able to arrive at one or more areas you want to improve in the perioperative workflow. Set goals: What do you want the outcomes of your efforts to be? Create a pilot: Pick one area in the workflow and pilot the new processes and procedures you want in place. Start small: Pick one area of surgery to start with as part of the pilot project. Be flexible: What works for one surgical specialty may not work for others, so make adjustments to the processes accordingly. If you are familiar with everything that goes into making a surgical case successful, you know that this is merely scratching the surface of how to make improvements to perioperative efficiency – but it’s a great start. If you have stories on how you have improved your perioperative workflow, or want more insights on how to do so, I would love to connect.